This policy brief explores and explains the concept and rational of co-creation, both as a general concept as well as in the specific context of sustainability science. Furthermore, it takes a detailed look at its use and potential in the framework of European research & innovation funding. On this basis, it identifies a number of lessons learned with regard to the application of the concept and puts forward concrete policy recommendations. The RECREATE policy brief, written by Ecologic Institute's Dr. Martin Hirschnitz-Garbers, is available for download. Co-creation is a means to improve and foster the participation of end-users by actively involving them in innovation processes. This is believed to yield a number of benefi ts, including bringing in additional knowledge and creativity; building partnerships and trust; increasing end-user satisfaction; and fostering legitimacy and acceptance. Hirschnitz-Garbers, Martin (2018). 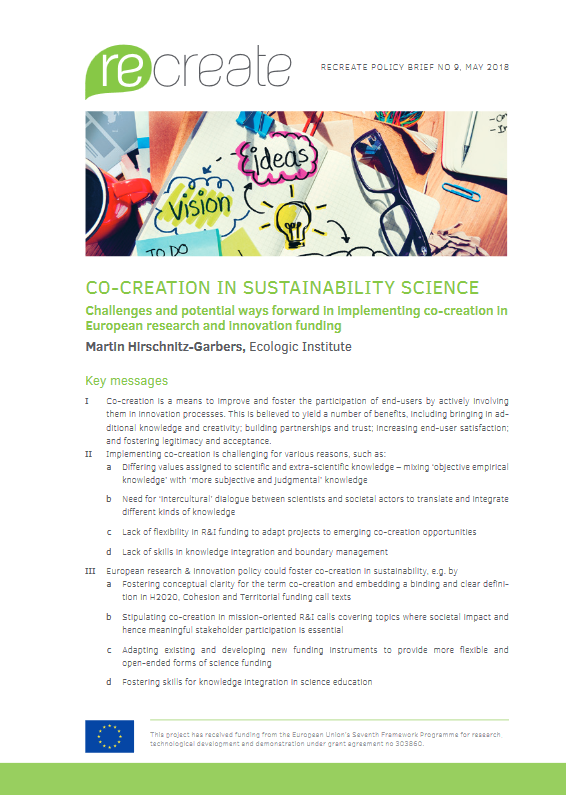 Co-creation in Sustainability Science. Challenges and potential ways forward in implementing co-creation in European research and innovation funding. RECREATE Project Policy Brief No. 9.